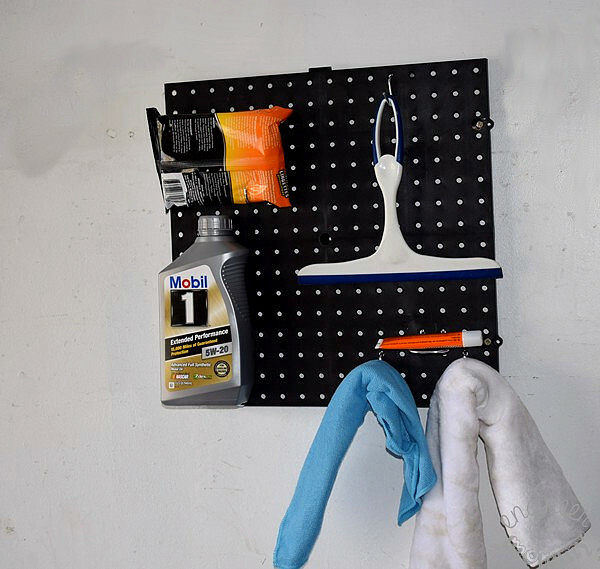 Keeping my car care supplies neat & tidy is easy thanks to this DIY Auto Care Pegboard Organizer. It took only 30 minutes to install and it will serve me well for a long time. Now I can see all my car care supplies at a glance, from those microfiber cloths to Mobil 1™ Extended Performance. When it comes to car care, I am not one that is scared to get my hands dirty. I already know how to add windshield washer fluid, replace the cabin air filter, and do other basic auto maintenance tasks. And I’m learning more of them each day! My husband has taught me a number of things about keeping a car running in peak condition over the years. One thing he has always stressed is the importance of regular oil changes. When it comes to properly maintaining a vehicle, getting regular oil changes is essential. While he has changed our vehicle’s oil in the driveway before, we have also used the Auto Care Center at Walmart many times. It affordable & convenient… and I know my vehicle is in good hands there. However, sometimes we do our own oil changes in the driveway. If you do the same, make sure you dispose of the oil properly – you can recycle the oil at Walmart Auto Care Center! And when it comes to selecting the right oil for our car, we always turn to Mobil 1™ Extended Performance. I love that Mobil 1™ synthetic oil protects more than just my engine! By choosing a high-quality motor oil, we are able to perform fewer oil changes and fewer oil changes reduces overall waste! Not sure which oil you need? Use this handy oil selector tool! 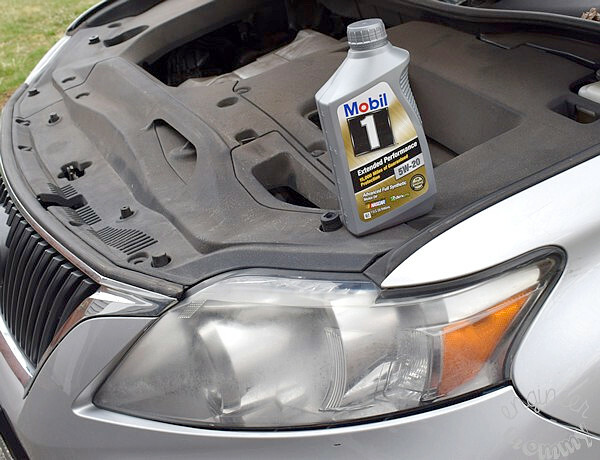 Purchase 5 quarts of Mobil 1™ in-store or get a Mobil 1™ oil change at the Auto Care Center. Recycle any used oil at an Auto Care Center. As an added perk, shoppers that buy 5 quarts of Mobil 1™ synthetic oil or a Mobil 1™ synthetic oil change at the Auto Care Center are eligible to receive a $10 Select Certificate (with a valid receipt) valid on a future Mobil 1™ purchase at Walmart! Awesome, right? 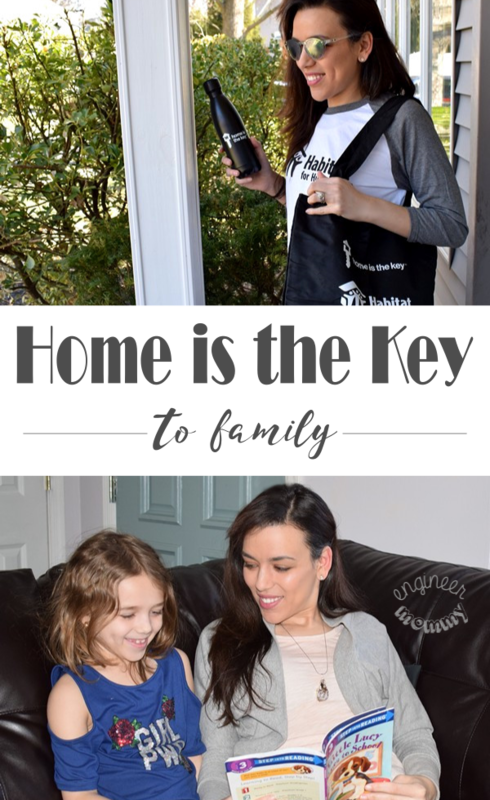 Click here for more details on the giveaway, including all the rules & FAQs. Please note that entries for the sweepstakes are limited to 2 per customer (1 for purchasing and 1 for recycling). To keep all our car care supplies, including Mobil 1™ Extended Performance, neat & tidy in the garage, I set up a Car Care Pegboard Organizer. It serves as the perfect spot to corral all our car care essentials! First, select a blank wall to install the pegboard. I found a great spot in our garage right next to some hooks, where we hang lawn equipment. 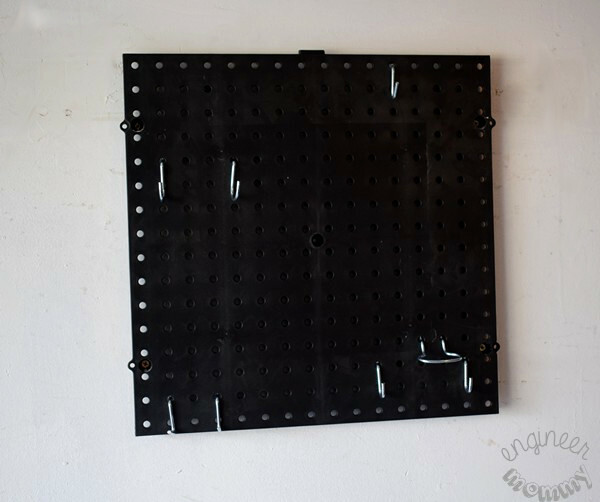 Use the mounting holes in the pegboard as a template to pre-drill some pilot holes. TIP: For maximum support, position the pegboard so that the screws will insert into wall studs. Otherwise, use heavy-duty anchors. Microfiber Cloths: perfect for cleaning the car, tires, etc. Scratch Remover: smart for taking care of minor nicks, scraches, etc. Grab a set of pegboard accessories: hooks, supports, locks, etc. You can get a mixed bag of these at Walmart. Position them on the pegboard so that you will be able to hang all your car care items. Hang everything up! Admire your work. Now this is much better than throwing everything inside a big bucket, am I right? Now I can see everything at a glance! I also decided to place my Oil Change Tracker printable right next to the pegboard. This essentially serves as my one-stop car care station. 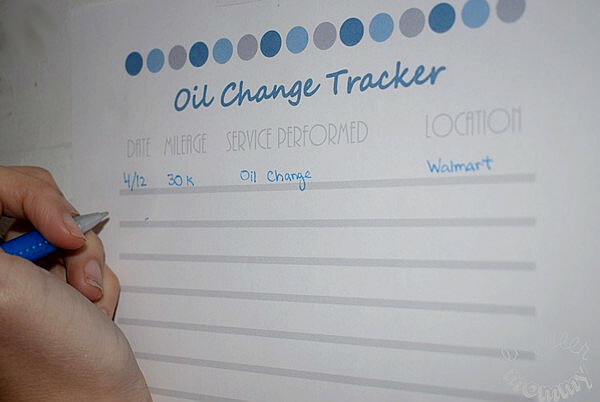 The tracker printable is perfect for keeping a log of auto oil changes & other maintenance services. To print a copy for yourself, click here. I’m loving the way my pegbord wall looks now. It’s super organized and functional! Don’t forget to check out Mobil 1™ Extended Performance Motor Oil for your vehicle. Keep in mind that Mobil 1™ has a smaller carbon footprint than conventional motor oils. ** And when changing your own oil, make sure to dispose of it properly – this month, recycle the oil at a Walmart Auto Care Center for a chance to enter the Earth Day Drive Away sweepstakes! 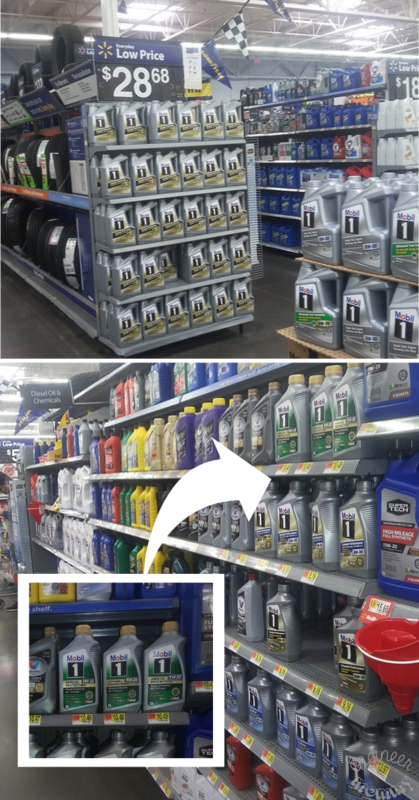 Check the Auto section of your local Walmart to purchase Mobil 1™ Extended Performance for your own vehicle. Keep in mind that Mobil 1™ can reduce the carbon footprint of your vehicle by the CO2 equivalent of 96 lbs! * Those are impressive stats, right?! 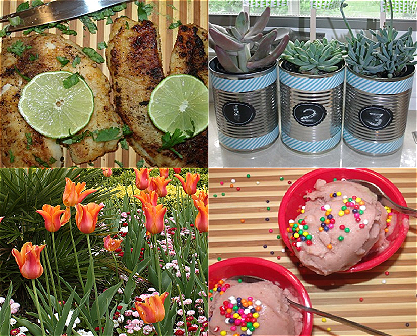 Don’t forget to enter the Earth Day Drive Away sweepstakes before it ends! 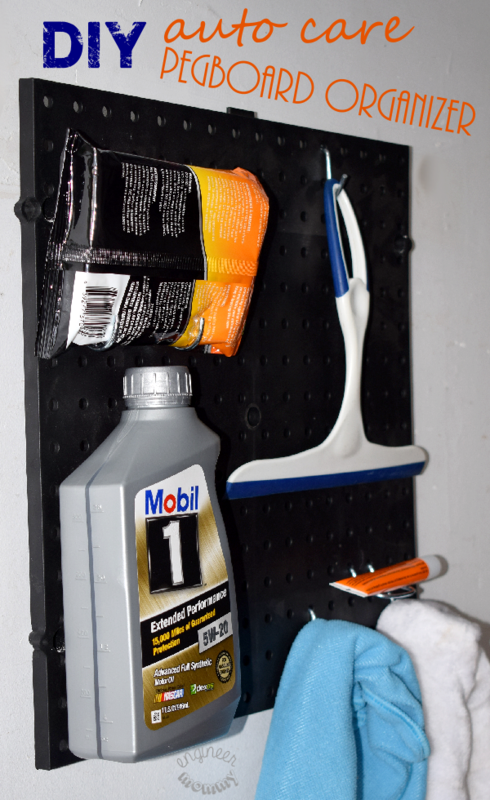 Make a DIY Pegboard Organizer for your own garage and add Mobil 1™ Extended Performance to your shopping list. 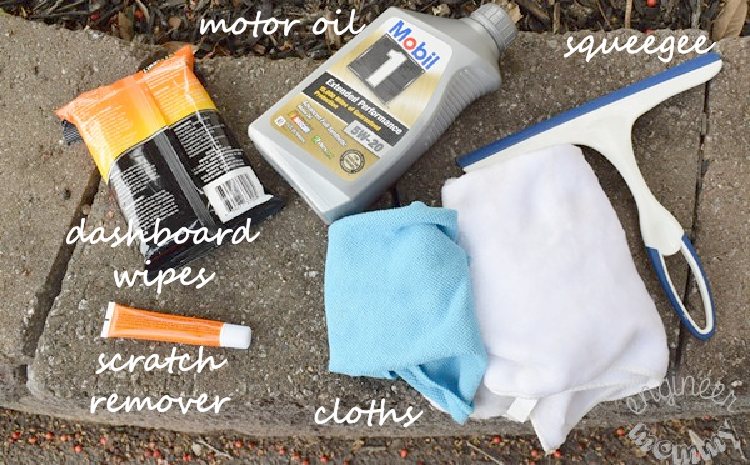 How do you keep your car care supplies organized? How do you keep track of oil changes? *Estimates made based on CO2 equivalent emissions derived from Life Cycle Assessment of Mobil 1 vs. conventional motor oil. Assumes switching from a conventional motor oil of higher viscosity grade to Mobil 1 Annual Protection. Include Production, Use, Disposal, and Fuel Economy attributed to motor oil over its lifetime. Calculation based on average U.S. vehicle engine oil sump size, average MPG, average oil change interval and average annual driving distance. Assumes nominal fuel economy improvement when switching from a higher viscosity grade to lower viscosity grade. Assumes new vehicles under warranty follow OEM recommend oil change interval. Mobil 1 Annual Protection is guaranteed to protect for one full year or 20,000 miles, whichever comes first. You may or may not obtain these benefits depending on how you drive and maintain your vehicle. 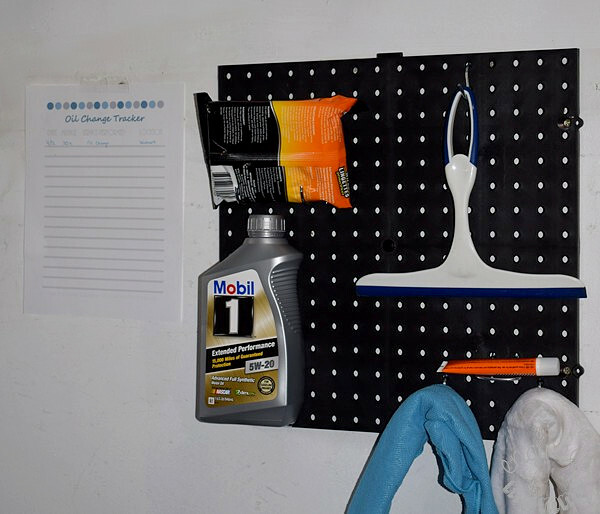 That pegboard is a great way to keep your auto care supplies handy and to keep up with oil changes. 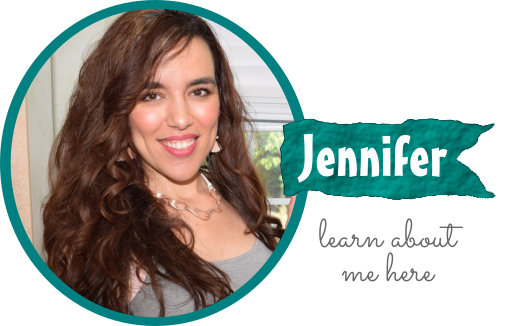 It’s such a great way to keep everything organized and I love that I can do it all myself. My car tells me when it’s due for an oil change. My Grandpa had a bunch of peg boards in his garage, he was always very organized. I love your DIY pegboard organizer. It looks like it does a wonderful keeping everything organized and tidy. First of all – yaassss girl for getting your hands dirty! We just got a new car and I have no idea where all the things are. I really need to know where — I ended up just sending it to get a change (it was a freebie though!). But next time, I need to. I do love the peg board idea. I don’t like messy garages. 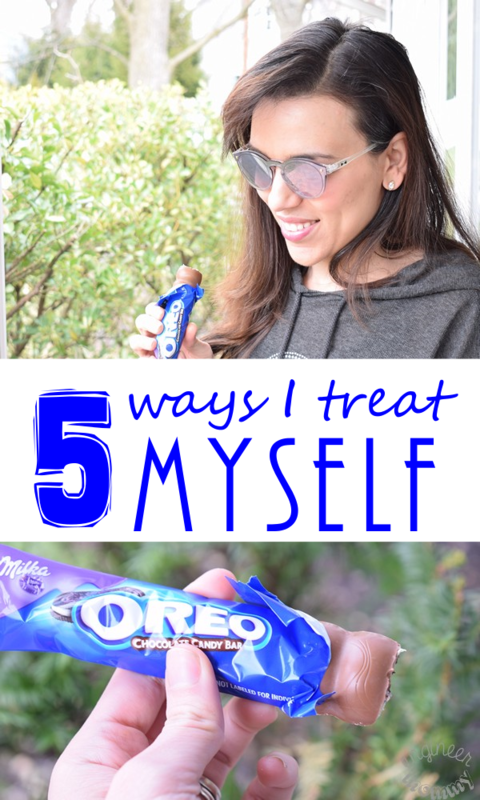 This is super simple and can be done in no time! It’s awesome to keep everything organized so you know where to find them when you’re working on your car! Love this pegboard idea and I’m definitely considering making one at home! I need to make this organizer. I never know when I should get my oil changed. Usually my car dings at me, but still. 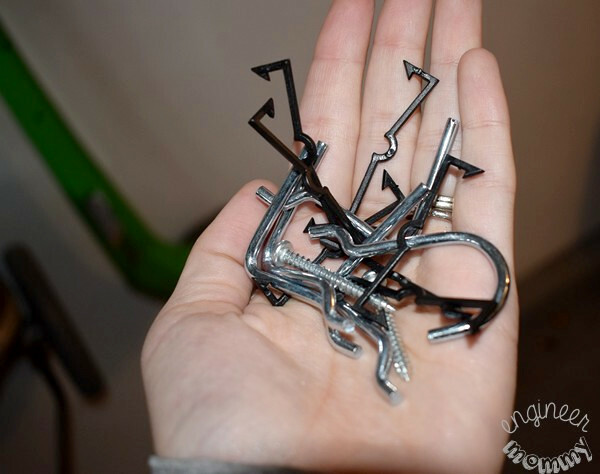 My husband is trying to do something like this to organize our storage area. I like what you suggest here. It’s creative and it is something I can easily do. This would be great for us to keep in the garage! Such an easy way to organize and get everything up high at eye level when I need it. Great idea! I love the idea of adding a peg board to the garage wall. It is always nice knowing where your supplues are when you need them. My dad taught me how to maintain a car. Only 1 thing he didnt teach me and I ended up learning the hard way. The timing belt. I had no clue that cars were made with a belt instead of a chain. Growing up cars had timing chains. Needless to say, I busted a timing belt and it was the end of that car. Ive never made that mistake again. I like the idea of using a peg board to organize things. That would be perfect for not only our car stuff, but a lot of other things as well. This is a great way to stay clean and organized. Auto maintenance is a messy game. I seriously need to do this. Right now we have things just scattered about, and have to hope we can find things when we need them!